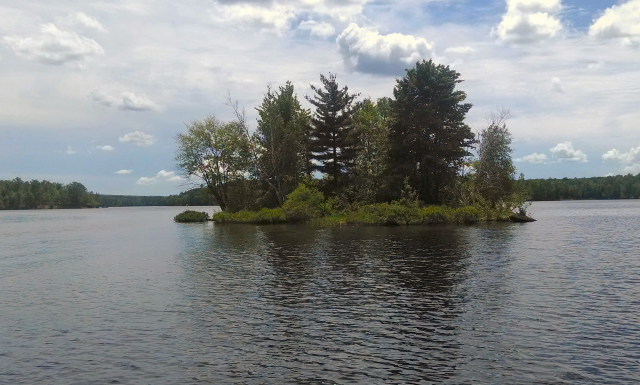 A few weeks ago we took the boat over to the Chippewa Flowage to do some exploring. The Chippewa Flowage in Sawyer County, Wisconsin, has got to be one of the most picturesque bodies of water I’ve ever seen – its been said that between 80-90 percent of its shoreline is undeveloped, therefore the raw wilderness of its treed banks, endless bays and islands and floating bogs is a breathtaking sight. 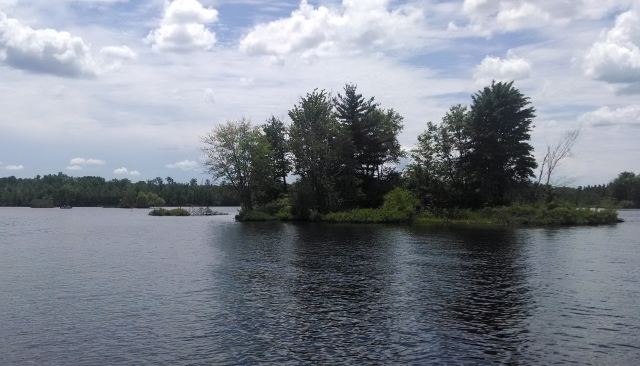 The ‘flowage’ was created when the power company dammed up both the East and West forks of the Chippewa River, creating a flowage of over 17,000 acres which provides excellent fishing opportunities. 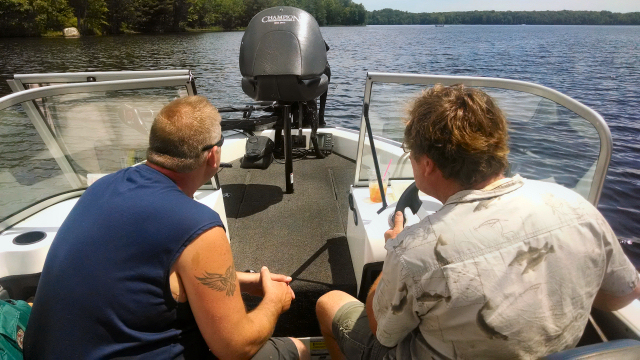 The day we were on the flowage started out as a beautiful sunny morning. Rudy, from Chief Lake Lodge came with us for a while and acted as our ‘tour guide’ showing us many interesting places and destinations on the flowage, such as ‘Bear Face Rock’. After a while we dropped off Rudy then set out on our own. We left Chief Lake and boated up through Tyner to the Banana Islands – the scenery is amazing! 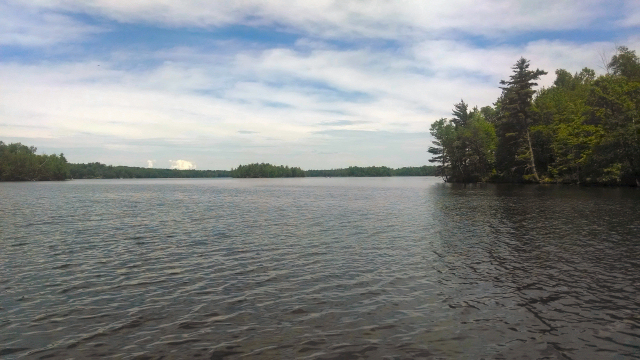 Its got to be impossible to see the entire flowage in one day, there are just too many inviting bays, channels, and lakes all connected together and it takes time to get through each. I can’t imagine boating here without GPS – it is so easy to get turned around and lost out here simply because the untouched shorelines are very similar no matter where you go on the ‘Big Chip’. 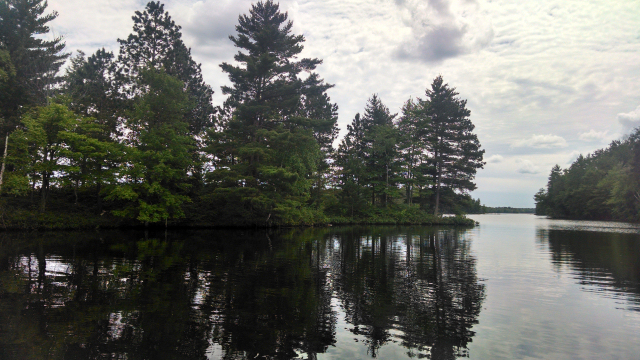 I took many pictures but I have to say that pictures do not do this area justice – it is impossible to capture the essence of the flowage with pictures. The flowage has 2 ‘sides’; an East side which is everything east of Hwy CC, the central ‘dividing’ road through the flowage, and the West side. Since we started out on the west side we wanted to see a little bit of the east side before we decided to start fishing. As we neared the CC bridge, we saw many large floating bogs. I’ve heard from many that these large floating islands really do move around and can create havoc by blocking access to bays and boat landings! We went under the bridge and boated along the beautiful shoreline for a while, but the day was getting long by then and we wanted to back to the west side to do some fishing so we cut our east-side tour short. The weather started changing also, what started out as a warm, sunny summer day slowly became an overcast, gloomier-looking day as the wind began to pick up. By the time we made it back to the far west side and up the Crane River, the temperature had dropped, the wind picked up to a fair breeze and the sun took residence behind the expansive sky of clouds. When we left the cabin, Greg hastily grabbed two muskie poles from the porch – neither had been used since sometime in the 1980s and had old lures held on by even older line. We stopped part way up the Crane River and decided to throw our lines in. Almost immediately Greg caught a pretty nice sized Northern and threw it back. A short while later as we were casting out from a point in the river, Greg’s pole went down and he was suddenly fighting with it. He excitedly claimed that it had to be a muskie on the end of his line and hollered for me to get the net. Nice. We didn’t bring the muskie net – we only had the walleye net in the boat so that was going to be it. As the big green back surfaced I swooped the net down and got the fish in the boat, but it was not an easy task. I marveled at the sight of it as I’ve never caught a muskie myself! Greg was hurredly working on getting the hook out so he could get the fish back in the water, and we snapped a quick picture before release. We fished the river for a short while more but nothing bit so we made our way up to Crane Lake. 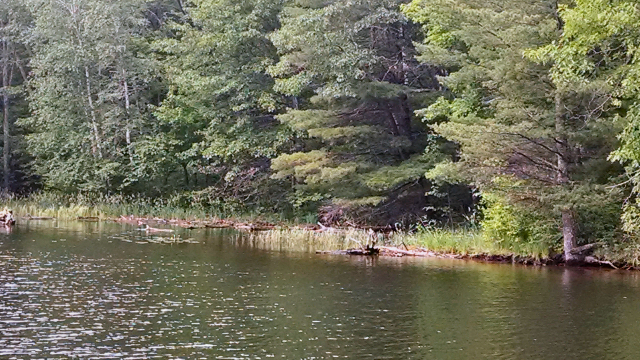 We fished a few weed lines and had some fish hit but couldn’t get them hooked. I was using a bucktail with a spinner, and not being used to the constant casting and retrieving my arms were getting a little rubbery. Just when I was thinking this is a lot of work, Greg starts yelling that he’s got a big one on the line! I watched him struggle trying to bring the fish up- and as the muskie surfaced I could see this one was quite a bit larger and thicker than the one he caught down river so the excitement continued to build! I grabbed the net and tried to get this big one in the boat – but I hooked that old reef hawg lure on the outside of the net and couldn’t get it flipped around quick enough. We lost this nice fish just as I almost had him out of the water – he was so heavy and because I couldn’t get him all inside the net I was trying to scoop him out and it just didn’t work. Of course, there is always going to be an embellished story about ‘how I lost the big one that he caught’ because of my netting technique, but every time Greg tells about it, I always interject ‘geez, who goes muskie fishing with a walleye net and expects anything other than what happened?’ Then he has to admit that he didn’t think to bring that net. 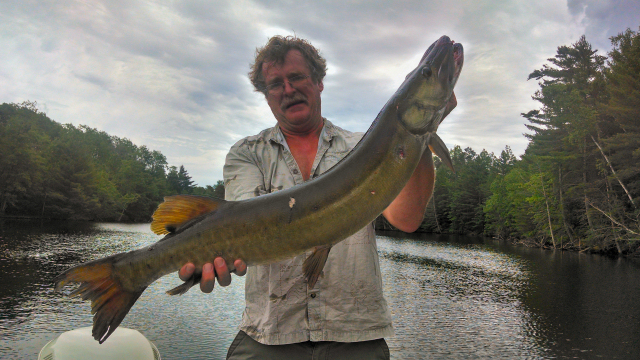 And I do understand – neither of us even thought we’d catch a muskie, much less two! After all the commotion was over, the darkening skyline told us our day was coming to an end so we headed back to the boat landing to pull out. What a memorable trip through the Chippewa Flowage! We are planning another this weekend if our work schedules allow it, and I can’t wait! 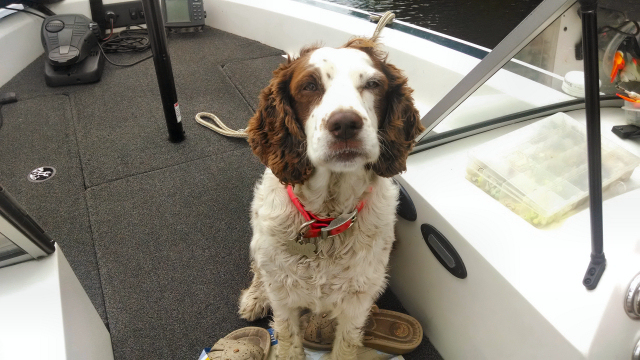 This entry was posted in Area Lakes, Boating, Fishing, NORTHWOODS LIFE, Scenic Observations and tagged boating on chippewa flowage, cabins for sale on chippewa flowage, cathy lareau, chippewa flowage, crane lake chippewa flowage, dolly springer spaniel, fishing on chippewa flowage, greg kopke, muskie fishing on chippewa flowage. Bookmark the permalink.